Pure Water Gazette » What Kind of Water Do the World’s Oldest People Drink? What Kind of Water Do the World’s Oldest People Drink? This week Besse Cooper died in a Georgia nursing home. She was 116 and officially the world’s oldest living human. Dina Manfredini, of Iowa, inherits Cooper’s title as world’s oldest living person. She is currently 115. 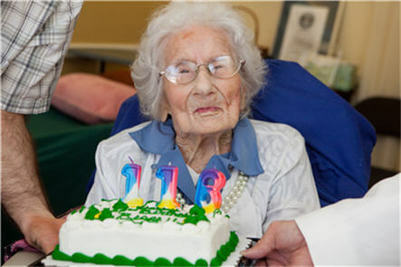 Besse Cooper, believed to be at 116 the world’s oldest person, died Dec. 5, 2012 at a Georgia nursing home. When very old people die there is almost always a newspaper article that tells their secrets for a long life. Jeanne Clement of France, who died at 122 and holds the world record for longevity (if you omit the Biblical geezers, who don’t really count), explained her long life by saying that God must have overlooked her. A very old man, whose name I’ve forgotten, attributed his long life to having eaten oatmeal cookies for breakfast most of his life. Books and articles about longevity always trot out the same old advice about eating well balanced meals, eating regularly, getting plenty of sleep, having friends, being in a “happy relationship,” and thinking positive thoughts. It is always disappointing to me that no one ever says they lived to 115 because they drank only mountain spring water or distilled water or Gatorade. We could, after all, use a hint. Water is water, but what particular type of water do the people who really live a long time recommend? In 1981, the Ecuadorian government hired medical journalist Dr. Morton Walker to study these people in depth. In his book, “The Secret to a Youthful Long Life,” Dr. Walker reported that his research showed the mineral rich water that the Vilcabambans drank was key to their long lives and health. Laboratory analysis of the Vilcabamba water determined that the unique balance of enriched colloidal minerals in the local drinking water was ideal for promoting optimum human health. Although Dr. Walker’s water theory helped with the marketing of some health food store supplements and drinks, there has, to my knowledge, been no effort to bottle and sell water from Vilcabamba, and everyone now seems to have forgotten the whole issue. This water comes from the melting of glaciers from the nearby mountains. These glaciers are hundreds of thousand of years old and grind the mountainous rock into extremely fine particles. In turn the fine particles of rock are suspended in this water and is called glacial milk because of its cloudy appearance by being so loaded with these minerals. Coming from glacial mountain streams and waterfalls this water carries a negative charge or negative ions and is called “living water.” This results in the water having an oxygen reduction potential and acts as an antioxidant in the body with the ability to neutralize free radicals. Also the negative charge makes minerals easily absorbable. Their crops are also irrigated with this colloidal alkalizing mineral water and thus unlike Western soils, hunza soils are not depleted of minerals. Keywords like “alkalizing” might lead you to suspect where the article is going. To live a long time, it appears, you have to 1) move to a place near a glacier, or 2) drag a glacier near to your home so you can drink the water that melts from it, or 3) buy a $2,000 electrical “ionizer” for your kitchen to turn tap water into the glacier water that the almost-immortal Hunzakuts drink. A fourth alternative would be to learn the secrets of the Immortal Jellyfish.